Re: Anybody get the TC-100 yet? Here is a picture of both TC-50 and the TC-100 together. Had a revelation. Get another TC-100 and forget the second TC-50. That would be more scalable with the power soak than having to switch to 6V6 tubes with the TC-50. Oh man dose the TC-100 sound so good at 100W. and you do not have to push it into insane volumes to get it there. I have no plans on selling the TC-50 currently have. If I do such and get another TC-100, something has to go. Mark V or the two RA100's? I think I like the RA's so may be easier to let go of the Mark V when that time comes. Something to think about. Since I do not gig, no point in making any changes to what I have now. If there is another Mark series amp to come out of Mesa, I hope it is better than the V.
Perhaps I can wait for what comes next out of the Mind of R. Smith and company. So far the pair up of the TC-50 and 100 using the midi cable is so much fun. You need an isolated signal splitter to drive both amps with one guitar unless your guitar has a stereo output (some do have this feature but may not be what you think it is). Considering how I have bonded with the TC-50, the TC-100 was a drop in replacement with a lot more volume capacity. Definitely has ample bottom end. After warming up the tubes as much as I have now, actually on both amps (loaded the 50 with the same color Mesa tubes), the 100 is sounding more like the 50 and vice versa in terms of palm muting characteristics. The TC-50 excels with the palm muting style. TC-100 is getting much closer to that dry thump that sounds so good on the 50. Everything else is on par so either way you go TC-50 or the TC-100 you get a great amp. I was impressed with the demos I've heard on the TC100. Even my computer speakers indicated more punch in the 100 vs the 50. I am not at all surprised by your assessment. My TC50 is getting close to eclipsing my opinion of my Dyne. Now that I have a huge project off my list, I hope to be running my 50 and Dyne together. I still have a couple smaller projects ahead, but those are minuscule compared to the one I just completed. I still have no regrets with my purchase of the TC50, and have no plans to get the TC100. But, had I known a year ago the 100 was coming with the reactive attenuator, I may have waited. The thought of 4 6V6 tubes choked down to 3 watts (would that actually become 1.5 watts with those tubes???) and the master wide open seems like I would be in Asgard. I am still impressed with both the TC-50 and the TC-100. After installing the blue color coded Mesa EL34's in the TC-50 to match that what came in the TC-100, I am more impressed with the TC-50 than before. I fail to hear the lack of bass with the TC-50 as mine is perfectly balanced with the midrange and treble. So far the TC-50 has not disappointed me in the tone department. The TC-100 is just as great with a bit more saturated characteristics at 100W. Driving two cabs with the TC-100 was very impressive considering I ran both of the Vertical 212 cabs. Now that was riveting, just as much as the JP-2C under the same load conditions. I did the same with the TC-50 and that was good but not as massive as a 100W power plant can provide. A 412 cab is a better choice for the TC-50 vs running to vertical 212 in parallel. I am happy I have both amps. I would have been just as pleased if I did not get the TC-100 or the TC-50 so I have no regrets having both amps. Based on some of the video's that have surfaced with the TC-100, I would not doubt there would be much difference if the TC-50 was used instead. I also have a 6 of the gray color coded EL34s. Two of which were originals that came in the TC-50 and the other 4 have not been used. Most of all I will be patient with the TC-100. I jumped on the TC-50 a bit prematurely for the same reasons and did not like it much at first. Now I love it. Time to change preamp tubes in V3 and V4. The clean channel will remain unchanged as that sounds awesome. I am glad that Mesa stayed with the two isolated preamps, having the clean separate from the high gain channels. Difference between the Hi gain and Lo gain is one preamp gain stage. very much the same as the Royal Atlantic and the Electra Dyne. Unlike a Mark series amp, where all the tubes are cascaded and harder to isolate one tube without affecting some other feature. the TC series is laid out with two primary preamps that each use a pair of tubes. reverb uses one tube and does not share a triode with a gain stage, FXloop is one tube and obviously the PI is one tube. Say you did not like the clean channel for some reason, you can change preamp tubes in V1 and V2 and not effect the hi/lo gain channels. In essence, V1 is the primary stage for the clean, V3 is the primary for the gain channels. In another perspective, the amp has two V1 tubes if you think DR, Roadster, Mark or other amp where V1 has the first gain stage for all channels. If someone says change V1 for a better tone on the Hi /Lo channels they actually mean V3 since this amp is quite different than the ladder style cascaded gain structure of most amps. I currently have a SPAX7 in V1. I think I will swap that with V3 to pull some of the top end off channels 2 and 3. I also asked Mesa if I can specify a color code on the power tubes. I believe mine are grey currently and would like to try some green, yellow or red. I haven't heard back yet, but I am guessing they will tell me I can't specify a color code. I get my Mesa tubes from Sweetwater. I will ask for color codes specifically because that is what I may have in a given amp. They seem to have an issue with GRN and GRY as they look similar at first glance. TC series, look at tube task chart in manual. V2 and V3 are the tuneable positions for CH2 and CH3. Not sure where the tone stack sits on the preamp. I will find out this evening since I will be pulling the chassis again to tube roll. Should not be too difficult to figure it out. CH2 may have a bright bypass cap on the tone stack. If it is a fender circuit the tone stack would be on V2, Since it is a Brit circuit, (simlar to the CH2 on the Mark V) I would suspect there may be two gain stages in front of the tone stack. Not sure but I will figure it out. Knowing where the tone stack sits would be helpul for change in tubes and what tube should go where. May even try the JAN/Phillips 12AT7 in V5 as it is warmer than the Chinese 12AT7 tube. Also have an RFT 12AT7 I had used in the RA100 as it cut back on some noise I had with the Royal. Perhaps this is just a power tube phase, why the amp is getting brigher may be due to the two preamp tubes I installed prior or could be the power tubes still disihing out the harshness (these particular tubes are that way, so perhaps I have not gotten past that bright phase yet). After reading the MKV Saturation Mod thread, I tried a JAN/Phillips AT7 in V4 wondering if it would have a similar effect on the TC as it does the MKV. It was awful! But, putting one in V5 or V7 might be worth a shot. I also have a spare SPAX7, so I could load V3 and V4 with those and see if there is a high end roll off in channels 2 and 3. Or maybe a Mullard CV4004 in one or both of those slots would be worth a go, too. I will be putting the stock tubes back in place for a while. As much as I love the 6V6s, I want to run the stock tubes for a little while before I decide if I want to try to get different color codes. I, too, have been getting my Mesa tubes from Sweetwater for a while now. Much faster turn around time and the same price if I ordered them from Mesa direct. And then, there's always the little bag of candy to....wait for it.....sweeten the deal. Yeah, I order from sweet water for the Bit-O-honey pieces. I have already complained when I ordered the JP-2C, there was not bag of candy LOL. By no means did the TC-100 sound terrible, just bright. Not brittle or lacking anything. Definitely has plenty of bottom end to spare. The tonal character is a bit different than the TC-50 but generally they are the same. I can get a good tight sounding punch from the lo gain channel on the TC-50 without it sounding thin. So far the TC-50 has been a win since I bonded with it. TC-100 is just a bit different in its response to the tone controls. Still it is explosive in attack and response, bottom end is plenty. This amp will cut through the mix for sure. I have not gotten to the slice and dice part that is described in the manual. Perhaps that is a good thing. I pulled the chassis out again to tube roll V3 and V4, also tried a few different tubes in the PI. I have tried the SPAX7 (actually have two of them so I tried both at the same time). Odd thing about the SPAX7 as it did provide the similar character on the lo gain channel that I am getting with the TC-50 but made the hi gain channel a bit muddy. A pair of Mullards CV4004, a mix of CV4005 and Mullard long plate 12AX7 (this combo works quite well in the RA100) and then all of the Mesa 12AX7 tubes. As it seems the stock tubes were the winners. I think the issue of the brightness was due to the Mesa tube I installed in the V3 position to replace the one that came in the amp. All is good now. lo gain sounds great and hi gain is great too. Also have to learn that I need to be more conservative on the gain and presence settings. I was going to install a JAN/Phillips in to the 12AT7 position but did not get around to it. Since the signal passed through this circuit all the time a warmer tube may curb some brightness if it gets om my nerves, so far a change in V5 was not needed. The amp was bright but never got into the Mark V CH3 brittle zone. The TC manual does detail some information regarding higher gain settings and the treble control and its relation to the midrange Q that does overlap the treble a bit. Also the Presence control is not quite your typical presence function. This amp does not use the negative feedback from the speaker to create the presence. It is derived by other means due to the power soak. I was setting that a bit too high too. A little tweaking fo the controls and I was back where I started, impressed. 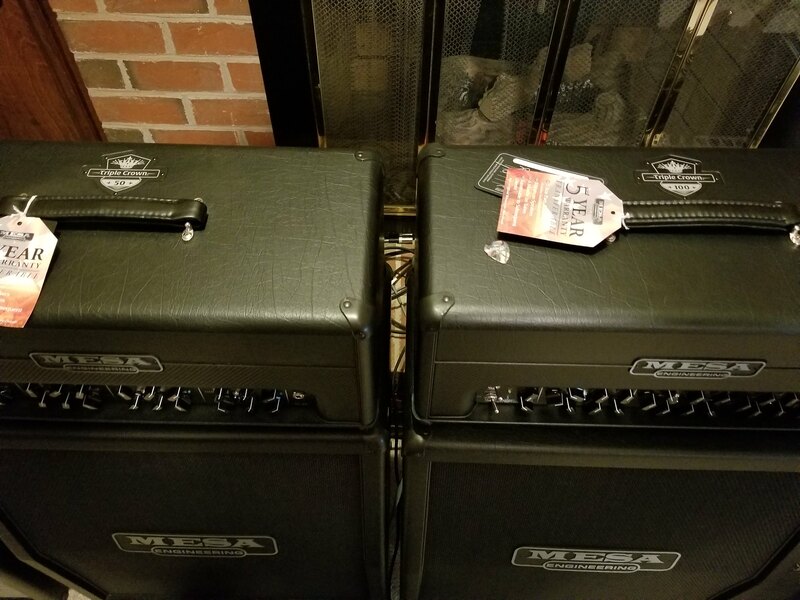 I also compared the Mesa Vertical 212 cab used with the TC-50 to the one I was using with the TC-100. It never dawned on me to realize one was britgher than the other, and it is. The one I am using with the TC-100 was the second cab I bought after the first to use with the JP-2C. Both cabs are close in tone but one does appear a bit brighter than the other. Or perhaps I am looing my hearing to go with it. I did run through my box of preamp tubes to find what works and what does not in the TC-100. When I did this with the TC-50 I did not notice any notable change to the amp. Perhaps that is good as I love the way it sounds. Sure I thought it was bright when I first got it but it has mellowed out since and sounds ideal. However the TC-100 brings more power to the speakers, change in iron on the OT (nearly looks identical to the one on the RA100 but I did not pull the chassis to check numbers on the RA, power transformer is definitely different than the RA so no point in comparing that to the TC-100). After reviewing the manual, did not realize the presence is not pulled from the speaker like it is with most amps. It is basically another tone control probably situated on the return triode section just before the phase inverter or it could be part of the phase inverter circuit (similar to the negative feedback circuit of what a presence control is but it is not a feedback circuit). In essence it is a low pass filter designed to pass the entire guitar frequency and to roll off higher frequencies created by the non linear distortion effects of the triode tube circuits. As expected, the TC-50 is the same. Tube roll, one the clean channel V1 and V2 did not seem to change much with different tubes. the stock tubes kept the clean channel on the warm side in normal mode with enough chime to be satisfying. Drive it becomes aggressive with a higher gain setting. I actually love it but wanted to experiment. I did that part last as I was more interested in curing the ping and low frequency mud I was getting on CH3. So what I did use were in the Chinese variety. The latest gen of Chinese tubes (those that only have two mica spacers, upper and lower, and do not use the metal clips on the plates) that are generally labeled as 7025 (preferred series) same as the Gold Lion ECC83 or the Ruby 12AX7AC7HG+ or the TAD 7025-s preamp tube. Tried one in V1 and then in both V1 and V2 and the clean channel remained about the same but not quite as warm as the Stock tubes. Much more phonic chime and crisp bold bottom end reminded me of my old Fender Deluxe reverb. That actually sounded good. I also compared that to the old Chinese Mesa tube with the square foil getter (same tube you can get from Doug's tubes indicated as the Beijing 12ax7, actually Doug has it listed as NOS-Chinese 12AX7. I bought some a while back and found they perform the same as the old Mesa tubes I have in my inventory from the Mark III days. If you want more of a Fender chime on the clean channel the Chinese tubes will give you that. Look for the 7025 tube which may be easier to find than the other as those are out of production. Curing the ping and drying up the mud on CH3: Since both V3 and V4 are related to CH2 and CH3 it was critical to find something that will provide good performance, eliminate the ping and fix the mud. Actually this seemed to be a sudden thing but I did change V2 early on with another Mesa tube as I thought the original was going microphonic. It was not. the ping noise will happen with almost every 12AX7 tube I used in V3 except for one type. I thought the SPAX7 was the fix but actually made the mud on CH3 more of an issue. With some tubes, after the amp has warmed up the ping noise with no signal may eventually go away. After first warm up it is there. The trick to cure the mud on CH3 was to install a brighter tube in V3. Think about it. The gain chain for CH3 is as follows: V3A -> V4A -> V3B -> tone stack -> V4B. that is three gain stages before the tone stack. Mesa branded JJ tubes are quite warm and may over burden the bottom end. Placing a brighter tube or one with more or less balance in V3 will enhance the grind on CH3 and not really effect CH2 too much. V4 sounded best with the stock Mesa tube. Tung Sol may work well in V3 but I found the NOS Chinese 12AX7 or the old Mesa 12AX7A tube to both cure the ping and dampen the bottom end enough that it still remains aggressive and more defined on CH3. Bonus was a bit dryer tone on the Lo gain CH2 so palm muting sounded very much like the TC-50. Open string or unmuted strings it sounds very much the same so it did not thin out CH2 by any means. All I had to change was one tube, V3 and done. Sure I wanted to expore and see what change in PI and a different 12AT7 would sound like. PI tube swap. I did have one tube to try which was the Sovtech LPS. One would think there is not much to gain from chaning the PI tube. The signal has to pass though it and it does have its associated impedances so yes it will effect tone to some degree but may not be noticable. What will change is volume. the balance Sovteck worked ok. Not really much of a difference. I actually prefered the Mesa tube in the PI position so I kept what was original. Last tube: FX loop V5. Yes this tube position has an impact on tone more than you would think. Sure the send is derived from a cathode follower circuit and the return needs to be boosted. Either way you look at it, both are gain stages, one is less than unity (hence it reduces signal levels) and the other is like typical common cathode circuit used to boost signal levels. The Mesa (Chinese) 12AT7 tubes are generally very bright. They do the job in V5 quite well and may not be something to consider. I found out with the RA100 a different tube in the FX loop will change the tone enough to be noted. That amp uses the same topography as the TC-50 and TC-100. Change in 12AT7 tube from one brand to another will have different results as each tube has their own set of tone response curves. Chines are considered very bright as well as a few others. https://www.tubedepot.com/tube-comparison-tool (there was another chart comparing the NOS tubes but I cannot find it) First up was the JAN/Phillips 12AT7 whcih offers a rich warm sound with good clarity. That did make the amp sound a bit warmer in overall tone. I did like it but also tried something else sort of middle of the road. NOS RFT ECC81-12AT7, similar warmth but with a bit more edge like the Mesa tube. Now that was an improvment. For the time being, I just pulled antoher new Mesa 12AT7 from its carton and stuffed it in and called it a day. Definately considered the RFT though. Perhaps later on in life I will change. Power tubes? not yet. I have not had a need or desire to change from the stock tubes. Sure the 6V6 is lurking in the background poking at me but I only have a pair of them. I will order more tubes soon enough. At the moment I am digging the stock power tubes. I finally got around to running the other cabs with the TC-100. Still I prefer the Vertical 212 cab for its tonal characteristic. But there is a surprise that popped up that was very rewarding. I did run the stock OS Recto 412 cab that I have with the gray and black jute grill I had bought a few years ago to complement the RA100. It is a good sounding cab but seems best hooked up to the RA100 than the other amps and not because it is cladded with similar adornments to the RA. Not bad with the Roadster or the JP-2C or even the TC-50, for some reason the TC-100 was begging for more bottom end. I rolled out the old OS Recto 412 loaded with the EV speakers. Now that was impressive. Somewhat bright but yet deep enough to bring out the best on CH2 and CH3. Clean was nice through the EV speaker but I favored the Recto 212 format for the drive mode on the clean channel. Next up was the Egnator traditional sized 412 cab that I loaded a quad of Celestion G12H75 Cream backs. This is where the characteristics became more interesting. That actually sounded great. Now for the surprise, I decided to run the smaller 412 with the cream backs in parallel to the Vertical 212 and that sounded amazing. As it seems, running a 4 ohm total load really made a lasting impression. This amp thrived on more load but a blend of V30 in the 212 and the four cream backs was almost heaven. I may have to roll out the horizontal 212 cab and stack the traditional cab on top of it. I will have to try the stock OSR412 combined with the H212 and see if I get the same results. 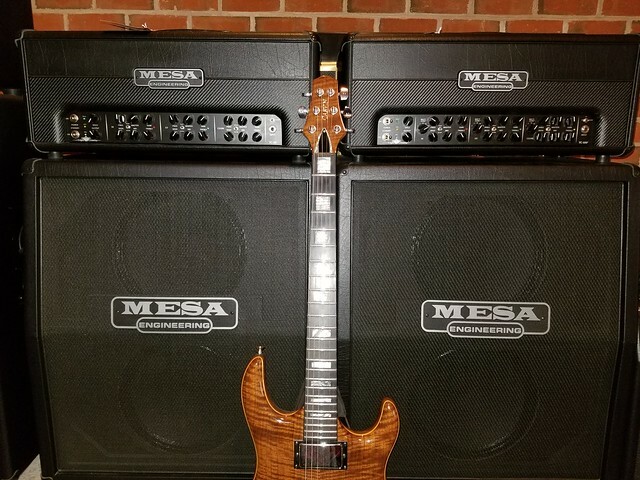 I would hate to go to the expense of getting another 412 cab just to replace the speakers, but a traditional sized Mesa 412 cab may be something of interest later on. Considering the response I got with the old Recto 412 loaded with the EVM12L black label speakers has given me reason to swap out two of them in favor of the Organic Timber Rhapsody speaker. A blend of the two speakers may have improved tone character with the other amps as well as the TC-100 since the OTR has more midrange and less top end than the EV black label speaker. Just for kicks, I tried slaving the TC-50 and vice versa to hear if there is any differences between the preamp circuits. I did this with the Lehle P-split II in the loop of one and ran the isolated output to the return of the other and turned on the FX loop on both amps. There is a bit of difference between the two preamp circuits especially with CH2 and CH3 but it is difficult to notice. Perhaps what it boils down to is the differences between the power supply, OT and number of power tubes. Comparing the TC-50 to the TC-100 set to 50W is not quite identical either. The TC-50 is much louder given the same master volume levels. There is a way to compensate for the difference and that is to raise the master volume on the TC-100. This is also similar to the RA100, at full power using the first position on the power soak it is much lower on output volume than when the amp is switched over to 50W power. One disadvantage with the RA is it sounds best with a V30 speaker or something similar but once you get into a darker sounding speaker arrangement such as an EV or similar type of speaker the amp gets seems to get bottom dominant especially with the clean channel. TC-100 as well as the TC-50 perform quite well with different speakers types and cabs. For some reason I am hooked on the Vertical 212 and the Horizontal cab is just as impressive. Today I received a reply from Mesa in regards to ordering specific color codes. Thanks for your email. You can certainly request a color code on the comments field of your order, however we may not have all the color codes available and may be weeks before we see the color code you may be requesting in stock again. Color codes are purely for matching purposes only and really have not variance on the tonal aspect of the amp. Below is a little write up on tubes we use and tube biasing for Mesa amps. We choose the best sounding, best performing and most consistent tubes from the world’s current supply of tubes, test them so that we know they’ll meet the requirements of our amps and sell only the tubes that are the perfect fit for our amps. Our current lineup of tubes are obtained from several different sources. We fix bias our amps and only sell the tubes that work for our bias setting. It makes it really easy for Mesa owners then to change tubes as wanted or needed, as they know Mesa tubes should allow their amp to perform just as it was designed to. Using MESA tubes, you'll not need to worry about biasing your amp." Hmm....no variance on the tonal aspect of the amp? They will not be specific on tone variances. All I can do is offer an opinion. So far I like the Blues in the TC-100 now that I have some time on them. I did try the grays for a short period but went back to the blues. Those also sound great in the TC-50 (did not notice much of a change with the 50W between the greens, grays and blues. There is a list somewhere in here on color codes and what the color means as a cross reference to GT. What does matter to some extent is the plate voltage and idle current of the tubes in the amp. Different power supply and OT will have a different tonal character. TC-50 is not the same as the TC-100 even though they have a common preamp board but assembled differently. I found an older set of yellow color code EL34s that came out of my RK1. I am fairly confident my father (previous owner of the RK1) never used the EL34s in the amp, so I am going to try them out in the TC50. I confirmed my stock tubes were gray color codes, so I can have a true comparison between the 2 sets.